Peel potatoes. Bring water to boil in a large pot and cook potatoes for approx. 30 min. In the meantime, peel and finely dice onions. Finely chop parsley, dill and chives. Slice cucumber in half lengthwise, then slice. 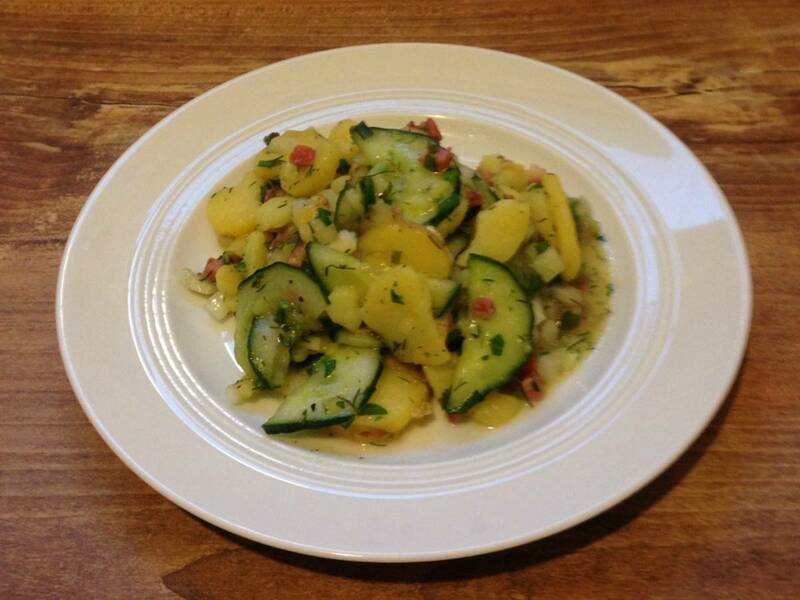 Heat a frying pan and add diced smoked bacon and cucumber. Sauté for several minutes, then remove from heat. Slice cooked potatoes and add to a large bowl. Sprinkle with some salt and add smoked bacon, cucumber, onion, and herbs to the bowl, but don’t combine yet. Heat vegetable broth in a pot until it’s hot. Add vinegar and mustard and mix together. Pour mixture over potatoes and other ingredients and stir to combine. Let rest until it cools slightly. Now, add flaxseed oil and season with salt and pepper to taste. Enjoy!